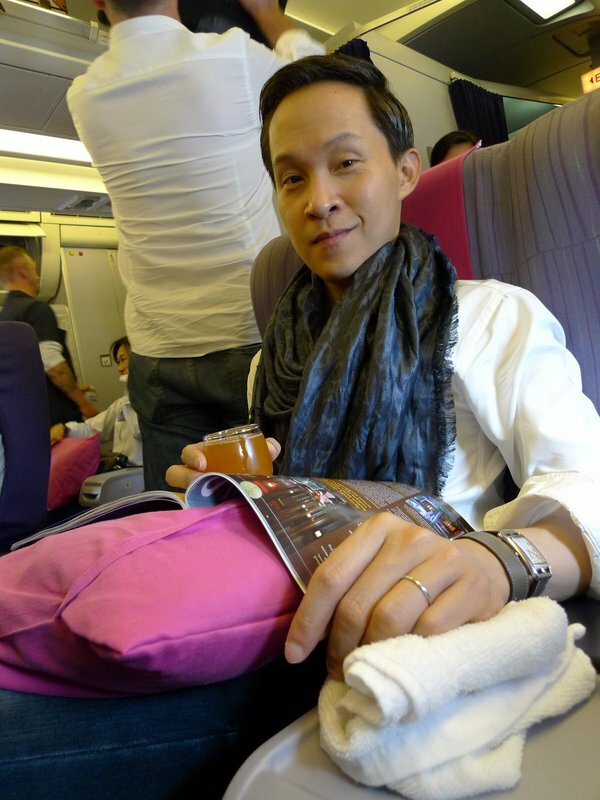 For our trip to Chiang Mai for the wedding, the grooms thanked us for Tawn’s help with the maids of honor’s dresses by flying us on THAI Airways business class. Of course, a 55-minute flight hardly needs business class, but it was a nice treat! Our plane, an ancient Airbus A300-600. Despite its age, the plane was clean and in good condition. Before departure, we were able to relax at the Royal Orchid Lounge in the domestic terminal. They offer comfortable seats and a range of snacks and beverages. The interior of the plane, which is used mostly for domestic routes and near-regional routes, is a bit of a throwback to a bygone era of decoration. The seats are equivalent of domestic (US) first class, comfortable but without a lot of extra leg room. Of course, it is perfectly comfortable for such a short flight. Tawn settles in for his flight, complete with a pink pillow, hot towel service, and a selection of pre-departure beverages. Pretty impressive for such a short flight! Despite the flight’s brevity, they actually serve a snack service, complete with crisp white linens, real silverware, and porcelain dishes. 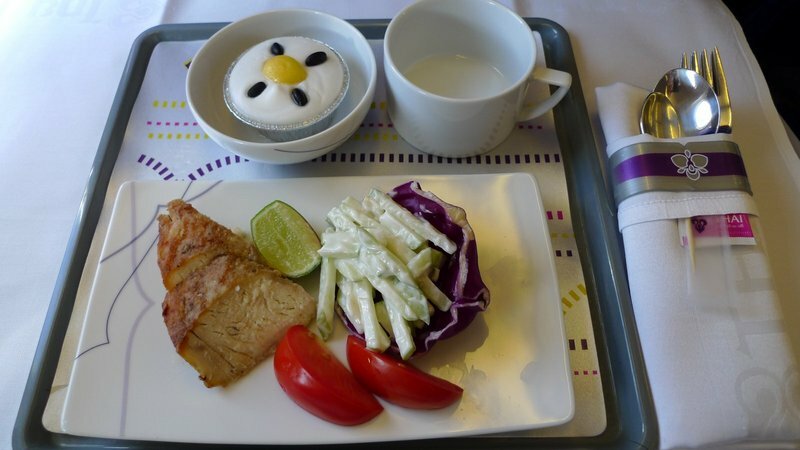 On the flight north, there was a poached chicken breast with a green apple salad. 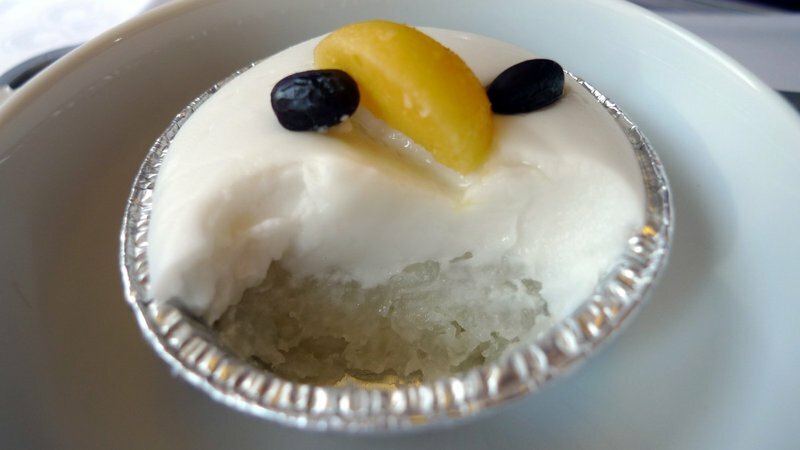 The dessert was a sweet sticky rice covered with coconut cream, fruit, and black beans. In addition to a variety of herbal drinks, coffee and tea service were provided. The pacing of the service was relaxed and we didn’t feel rushed at all. 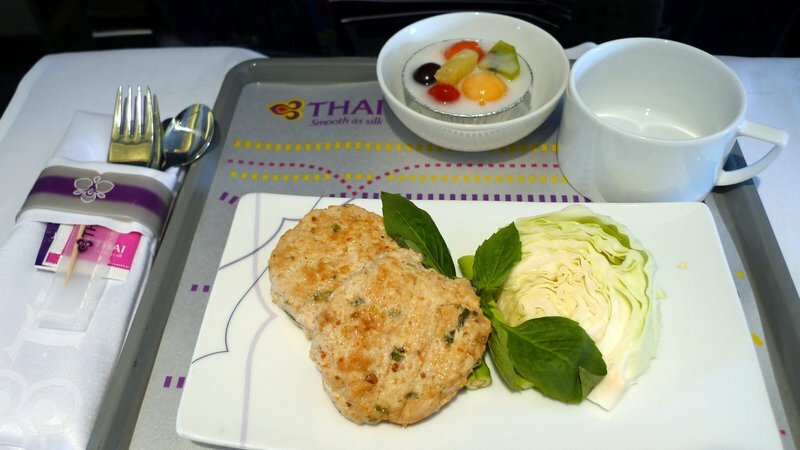 On the southbound flight, we were served cold chicken larb patties – chopped chicken with Thai spices, and fresh vegetables. The dessert was a coconut pudding with fresh fruits. Very tasty. 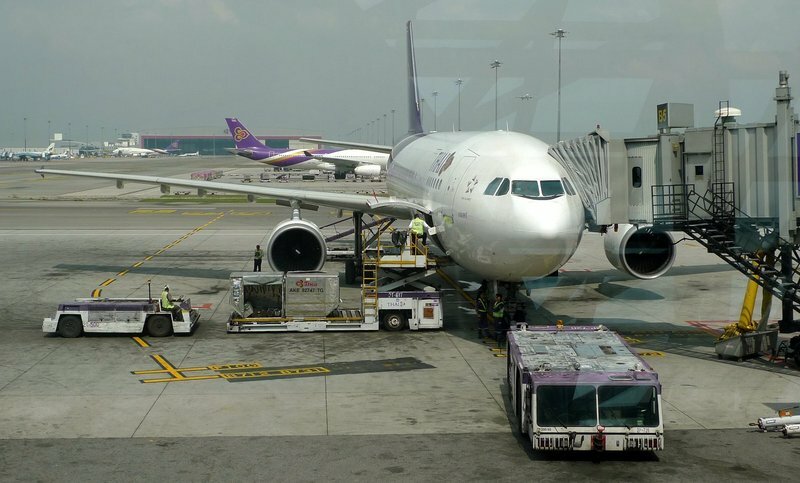 Our plane parked at the gate in Chiang Mai. Service both ways was very attentive and friendly. If I ever have the means, I’ll make business class my regular choice when flying! 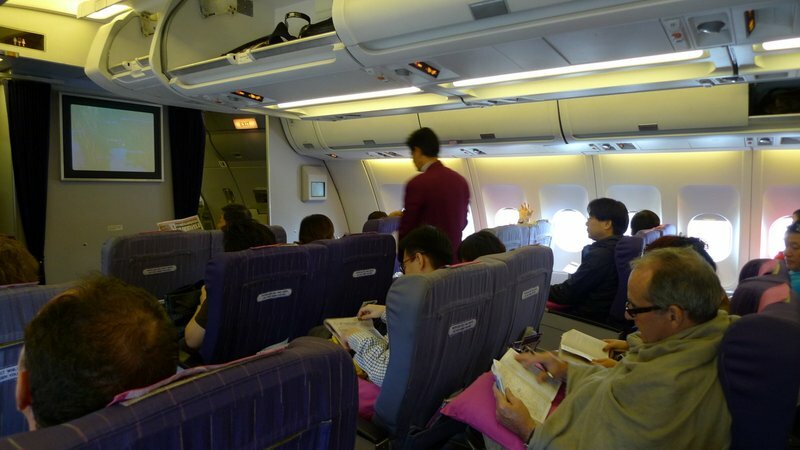 This entry was posted in Uncategorized and tagged airline, airways, aviation, business, class, TG, thai by christao408. Bookmark the permalink. Sounds like a good deal and certainly less expensive than first class. Silverware for such a short flight! That’s very nice and classy indeed! I missed the Royal Orchid Lounges at the domestic (Dong Muang) airport, nicer than the ones at Suvarnabhumi. Well, “nicer” I presume they still maintain the upkeep and decor! I need your friendship too!E-mail me!*muah*Thanks!-Jason. Wow -That is some nice looking airplane food. Why can’t the US carriers figure that out?? @Wangium – And then she left another spam comment immediately after yours! Argh – why do I get so many of these? @murisopsis – It is an interesting question. I can’t think of any 55-minute flight where any US carrier would serve a meal in the premium cabin. Honestly, I think customers have left their expectations we lowered to the point where carriers know they can get away with anything. @CurryPuffy – The domestic TG lounge at BKK isn’t much but the international ones are pretty nice. @Texasjillcarmel – We were lucky that our friends paid for us. I don’t think I’d ever spend money on premium class for so short a flight, but it was fun! @agmhkg – Yeah, am accruing on EVA right now but waiting for them to join Star Alliance next June. @Fatcat723 – Well, in this case, they don’t operate First Class except on certain long-haul routes, so Business is the equivalent of first. Can’t believe you got that service on a 55-minute flight. Great service. Glad your friends were so generous and gracious. I like the brightness and airiness of the plane. Food looks totally yummy and what a nice gift from your friends. That food looks amazing! I wouldn’t have thought it to be plane food for sure. Looks like you guys had a great journey. @Devilzgaysianboi – @Inciteful – @mizz_chan – Yeah, take that, US-based airlines! @ZSA_MD – @Grannys_Place – Yes, we are deeply indebted to our friends’ gracious generosity. mighty nice flight service much better than the us and the food looks good too. so much better that paying ten dollars for a brown bag with a drid sandwhich like they do here unless of course you go first class which i do every chance i get to upgrade for a small amt. There must be an art to serving a meal like that in such a short time without making passengers feel rushed. @ElusiveWords – There were at least 3 flight attendants in business class alone so that helped move service along quickly. @grannykaren – @grannykaren – If the fare is reasonable, an upgrade sure is a nice way to fly! correct me if i’m wrong. tawn’s shawl looks like one with… indonesian pattern. @christao408 – LOL. it just looks very much like one of those indonesian ethnic tribal pattern that one can easily find here. well, maybe not the same quality of material but the pattern certainly looks familiar. either way, it looks great on him. suits him well.